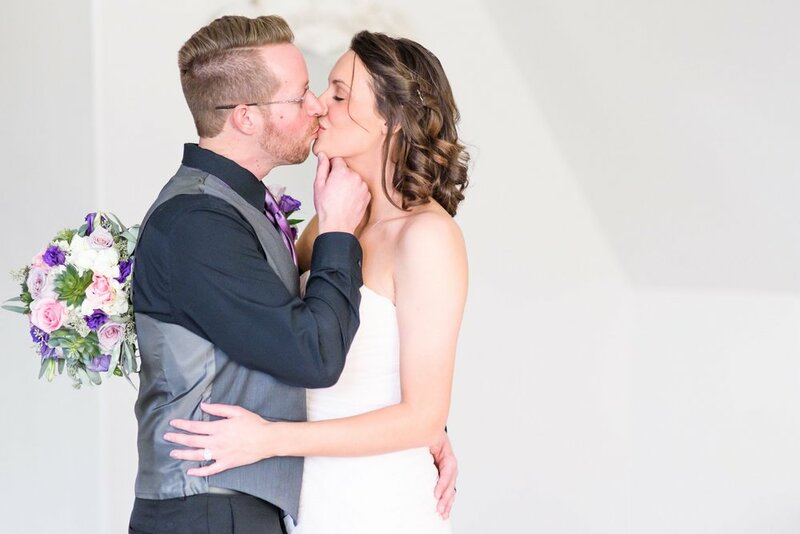 Abi and Brandon had the perfect little wedding ceremony in their home, with their close family and friends. After the ceremony, they met up with me to capture their Wedding Portraits. It was 24 degrees out that day, and we had made plans the week before to move their portraits to somewhere inside. My friend, Sharon Hundley's beautiful venue " Lynn Acres " is what immediately came to my heart when we started looking for somewhere. It is a new wedding venue located right in my hometown of Smithfield, and it is BREATHTAKING! The location and studio is just stunning. A photographer's dream for sure!!! I am loving seeing blush wedding gowns this year! Abi looked incredible in her gorgeous dress! Her pastel bouquet was the perfect compliment to her blush gown. I could of photographed these two all day! We had so much fun, and I am so excited to share a few of my favorites today. Congratulations to Mr. and Mrs. Hinson!! !